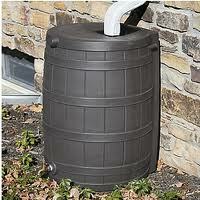 Rain-barrels are storage vessels that can collect and store rooftop runoff from a downspout for later use. By storing and diverting runoff, these devices help reduce the flooding and erosion caused by storm water runoff. And because they contain no salts or sediment, they can provide "soft" chemical-free water for garden or lawn irrigation, reducing water bills and conserving municipal water supplies. Additionally managing runoff from rooftops effectively disconnects these impervious surfaces, reducing a watershed's overall imperviousness. Rain Barrels are sized according to rooftop area and desired volume and can be used to collect both residential and commercial building runoff. Rain Barrels are available commercially in numerous sizes, shapes, and materials. Many are made to custom fit the available space and can be short and fat, tall and skinny, round, rectangular, or almost any size. By temporarily storing the runoff, less runoff enters the storm water drainage system, thereby reducing the amount of pollutants discharged to surface waters. 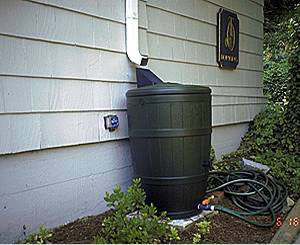 Additionally, Rain Barrel and their smaller counterpart referred to as rain barrels are typically used in a treatment train system where collected runoff is slowly released into another BMP or landscaped area for infiltration. Because of the peak-flow reduction and storage for potential beneficial uses, subsequent treatment train BMPs can be reduced in size. Inlet Inspection Annually before the rainy season Clean gutters of debris that have accumulated, check for leaks. Remove accumulated debris Monthly (during the rainy season) Clean debris screen to allow unobstructed storm water flow into the cistern. Structure inspection Biannual (before and after the rainy season) Check cistern for stability, anchor system if necessary. Check pipe and valve connection for leaks. Miscellaneous upkeep Annual. Before any major wind-related storms Add water to half full (if the tank is less than half full).